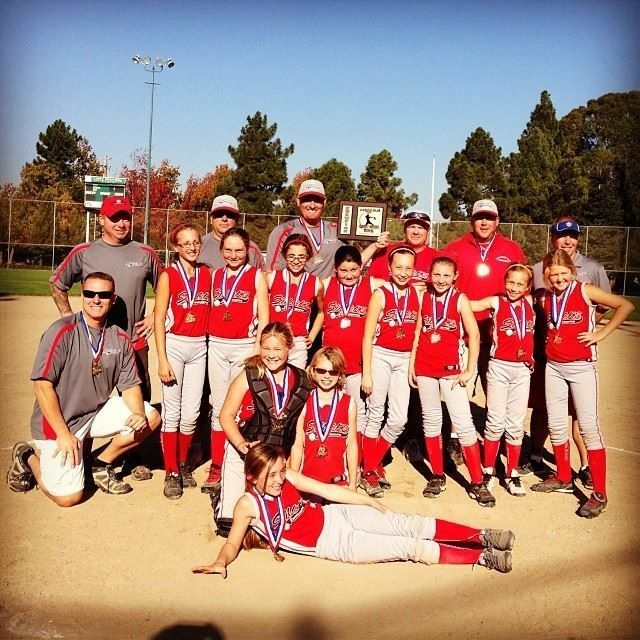 SMOKE 10U Champions in Pleasanton! 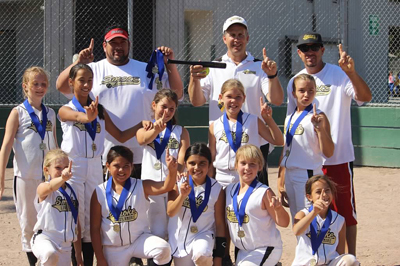 The Livermore Smoke 10U Fall Travel Ball team won the USSSA Kickin-It Fastpitch Softball tournament the weekend of September 20 at the Pleasanton Sports Park. It was the first tournament of the Fall season and the girls hit the ground running. Going 3-0 on Saturday and winning two games in "Walk-off" fashion, Smoke 10U earned the #1 seed for elimination Sunday. The girls from Smoke won their Semi-final and Final games convincingly over San Jose and Milpitas, outscoring their opponents 21-11. Great pitching and powerful hitting was the theme of their victories. 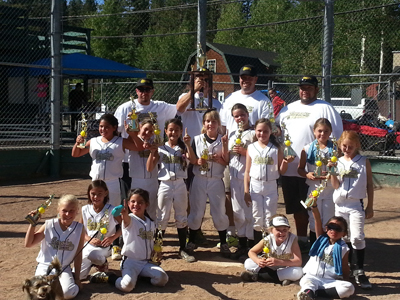 SMOKE 10U & 8U Champions in Tahoe! 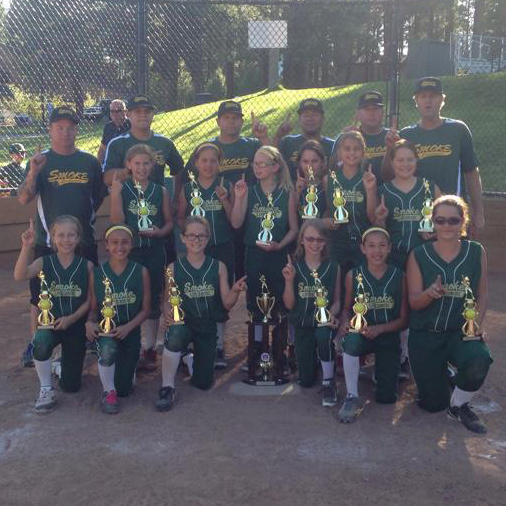 The Livermore SMOKE 10B team went 5-0 in Tahoe and took 1st place. The girls scored 68 runs and only gave up 11 runs over the five games. On Saturday, Breanna and Kendall pitched back to back perfect games with a lot of help from their defense. Everyone on the team also contributed at the plate. Top row: Coaches Dan, Aaron, Gary, Tim, Manager Craig. Middle row: Erin, Iliza, Kendall, Skylar, Katie, Haiden. Front row: Sarah, Keana, Raegan, Zoey, Breanna, Caitlyn. 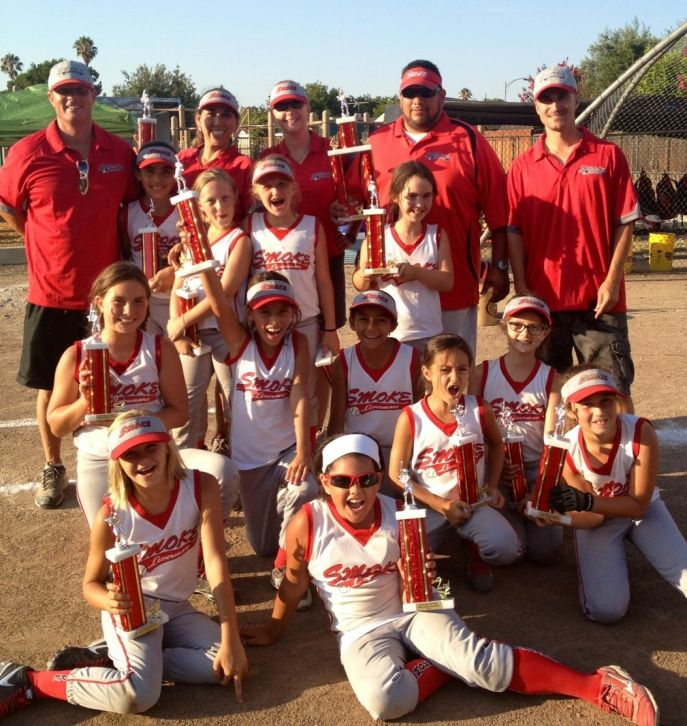 The Livermore SMOKE 8U Summer Travel Ball team played inspired softball the entire weekend. With a tough pool play schedule on Saturday, we managed to go 2-1, beating Novato Heat and the Vallejo Hurricanes while losing a tough late afternoon matchup to the Pleasant Hill Panthers. On Sunday the girls from Livermore managed wins against the Rohnert Park Rebels and Pleasanton Phantom and found themselves once again matched up against the Pleasant Hill Panthers in the Championship Game. SMOKE would not be denied in this tough game, coming from behind twice to win the game in 6 innings by a score of 3-2. Great pitching, timely hitting and an unbelievable double play to end the game secured the Championship. Thanks to our SMOKE 2013 sponsors for supporting travel ball! SMOKE 10B went 5-0 to win the Outwit Outlast Outplay tournament in Hayward. 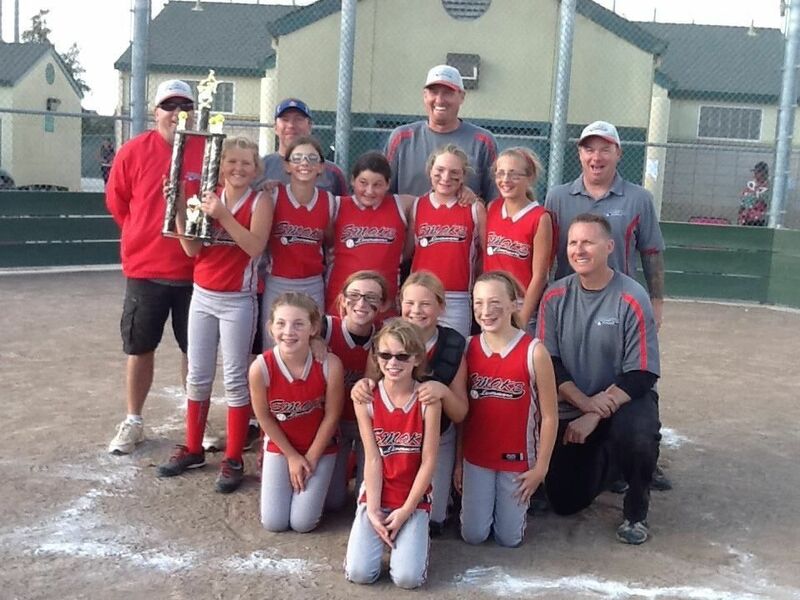 SMOKE 10B win the Silver bracket of the Monster Bash tournament in Fremont. 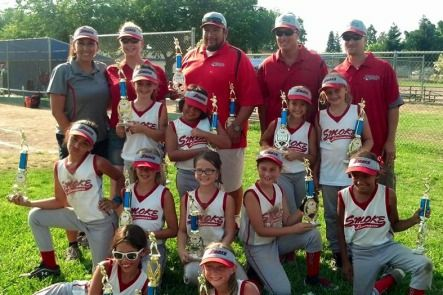 The Smoke 8U "B" team were a force to be reckoned with over the past weekend at the Wes Jones Memorial softball tournament in San Jose. Playing 6 games in 2 days, Smoke's opponents were taken by storm when faced up against Smoke's pitchers. In a total of 67 batters to come up to bat, 56 of them got struck out. The batters who were able to create a little spark off their bats were only to be met with trouble from Smoke's defense, who allowed just 8 total runs to score. Smoke's hitters sent a major shockwave thru their opponents, scoring 42 runs, making this tournament Smoke's best hitting and pitching performance to date. The LGSA Smoke 8U "B" team were on FIRE, bringing home the 1st place title at the Campbell Crush Butterfly Classic tournament the weekend of June 29-30. Smoke went 3-0 in pool play on Saturday, not allowing a single run to score, earning them the #1 seed position going into bracket play on Sunday. Smokes first game on Sunday would be against the #4 seed, MVLA Nova. From the first pitch down to last out, this game was a nail biter. Each team had strong hitting and played tough defense and at the end of 5 innings the game was tied 4-4, sending it into extra innings. Smoke would prevail 6-5 in 7 innings. The Championship game vs. Scott's Valley Trouble would end with a score of 1-0 in Smokes favor, crowning the girls 1st place champs out of 12 teams. Great Job Smoke!!! Pictured from top, left to right: Coach Melanie Herrera, Coach Kim Hood, Head Coach Elvis Aguilar, Coach Steve Johnston, Coach Brian Rapp. 2nd row: Skylar Jester, Kaitlyn Aguilar, Alizabeth Ruiz, Dakoda Hood. 3rd row: Marissa Herrera, Maggie Robinson, Raegan Chionio, Taylor Rapp, Emily Aleman. Bottom row laying down: Emma Hatcher and Delaney Johnston. 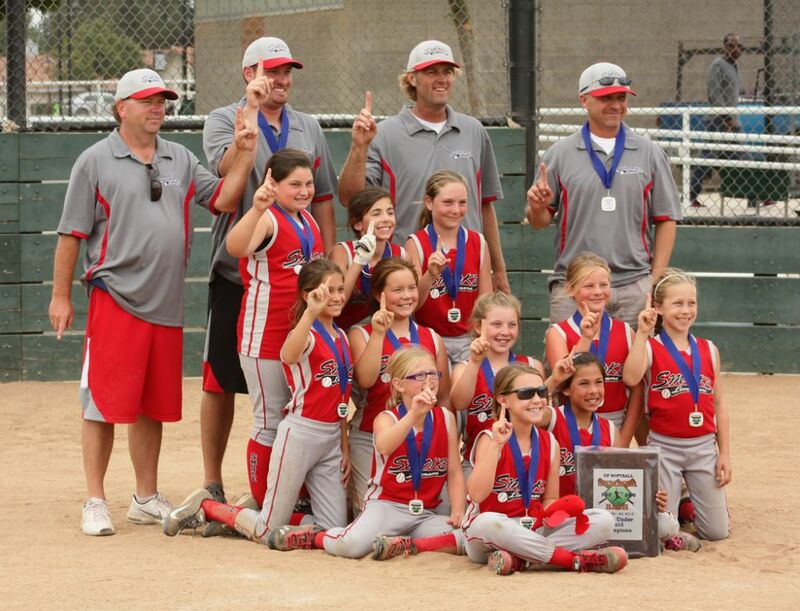 Congratulations to the SMOKE 10B team for winning the PGF Summer Bash Tournament in Sacramento!